The intraoral camera for sale is best described as an instrument that helps dental professionals communicate with & educate their patients. Considered one of the best diagnostic tools available today, there are plenty to choose from and selecting the right one for your practice can be difficult. The T2 Essential 8 Tips will help cut through the clutter and identify the key features most important to you and your practice. Deciding which to buy should not rely on a rep’s demonstration. Schedule an in-office demo so you can try the camera on patients before making a decision. And trust your auxiliary staff’s input since they’ll be frequent users. A trade show can be a great way to shop for an intraoral camera. With some planning, this is a great way to see multiple products under one roof. All too familiar are reps grasping the camera with two hands showing open margins, cracked molars and amalgams. Believe me? Check out the photo left and ask yourself if this is how you would expect the camera be used in your office? I would hope not. Although image clarity and color acuity are important, ease of use is often misunderstood. Sales reps are trained to make their product appear easy of use – even if they may not be. Bottom line, this is not a realistic condition. Ease of use is best determined by the cameras lens. A good optical system has a wide depth of field and requires little or no focusing during the exam. Position yourself as you would during treatment while holding the camera like a dental hand piece. Although a majority of cameras have it, a focus ring is an adjustment for lack of a good optical system and not an added feature. These focus rings and collars are usually placed on the camera hand piece. If constant refocusing is necessary, then the depth of field is inadequate for your purposes. A difficult product is less accepted by your staff and used less frequently. Most Wired intraoral cameras today are USB devices – a digital interface that allows direct connectivity to the computer. What most do not know is that USB has a 15 foot cable length limitation and extending through hubs is never a good idea. Care must be taken in positioning the computer to allow for this. 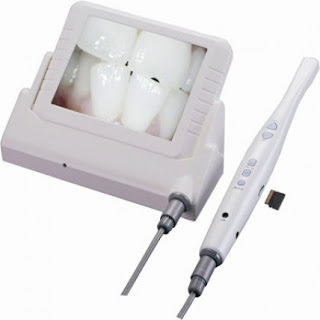 The intraoral camera should holster into position much like your high speed hand piece or syringes. With such a high ROI, the intraoral camera requires easy access – without it, usage suffers.